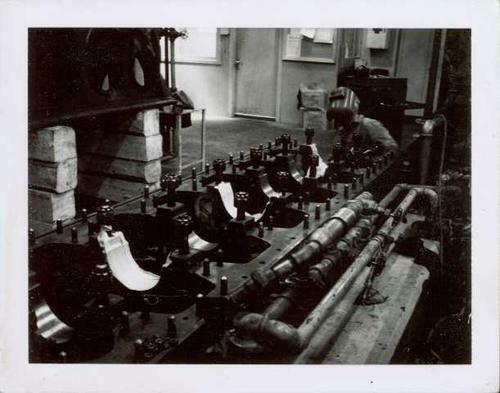 Photograph depicts an unidentified individual wearing a welding helmet, and kneeling behind large bearing cups of one of the Ruston Hornsby diesel engines that turned the generators in the power house on the Cassiar plant. Door, bulletin board, and miscellaneous supplies in background. Context of photo was determined by individuals who contributed to Northern BC Archive's Facebook Photo ID Project, contact archivist for short story and background information in research file pertaining to this photograph. Item is part of the Cassiar Asbestos Corporation Ltd. fonds. Image is one of five, see also items 2000.1.1.3.18.6 - 2000.1.1.3.18.9.